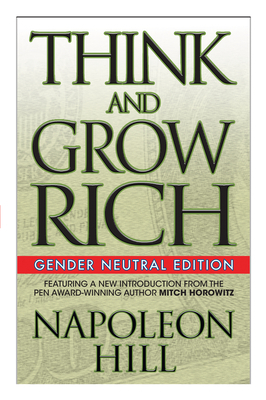 THE GREATEST SUCCESS CLASSIC OF ALL TIME, NOW IN A UNIQUE GENDER NEUTRAL EDITION Featuring a New Introduction From the Pen Award-Winning Author Mitch Horowitz There is literally no one who wouldn't benefit from reading Napoleon Hill's legendary Think and Grow Rich. The book is not only about acquiring money, but also about realizing any ethical aim or idea, whether you are an artist or student, scholar or solider. There is simply nothing else like it. Yet the language of the original 1937 edition may put off some readers, who find it antiquated or reliant on social assumptions of the past. No more. Now, historian and New Thought scholar Mitch Horowitz has deftly and carefully revised the original work into gender neutral language that seamlessly brings its social references into alignment with present-day standards. All of Hill's original lessons and examples are here for a complete and unforgettable reading experience. Mitch also includes a new introduction that spells out the need for this edition, and counsels how to use it to actualize your most cherished goal. Discover: - Why a Definite Chief Aim is the closest thing life grants to a magic elixir. - The importance of writing down your aims. - The uses of autosuggestion to increase your confidence, magnetism, and ability. - How to use your mind to receive ideas from Infinite Intelligence. - How to think accurately, and to avoid anything that could delay your success. Do not miss the life-changing opportunity to experience this self- potential landmark--and to discover, on your own terms, why Think and Grow Rich has won the loyalty of countless success seekers.